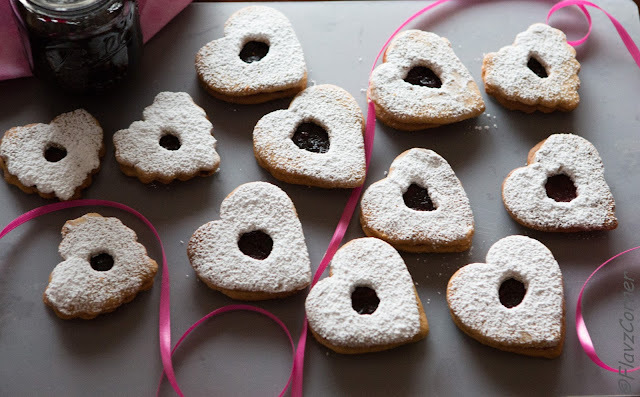 I was scanning through my recipe collection for a perfect treat for valentines day and was not able to bypass the Linzer cookies. I never attempted to make these cookies due to the perception that Linzer cookies are one among the labor intensive recipe. 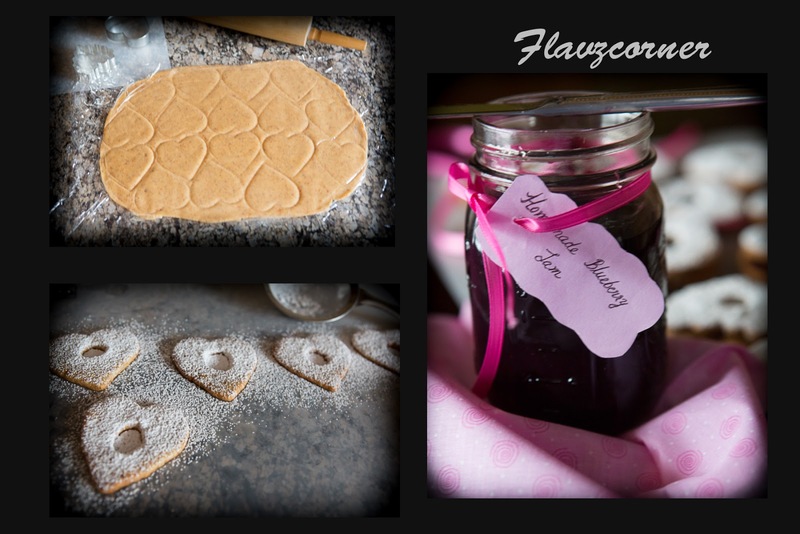 Since I wanted to make something good enough to post on my blog for valentines day, I thought I will give this sweet treats a try. It was not really hard as I thought; the most time I spent was to cut the cookies. But each bite gives you the crunch of almonds and the hint of lemon, which makes it worthy for all the effort you put into it. My kids loved them without the jam in it. The flavor really tickled the taste buds the next day. I made these cookies on the weekend to give myself enough time to do the cutting and baking while enjoying a movie. Try this recipe to bake some sweet treats for your loved ones. Mix the softened butter and granulated sugar in an electric mixture. Add the egg yolk, vanilla extract and almond flour and mix for another minute. Gently fold in the dry ingredients like flour, salt, cinnamon and lemon zest and knead for couple of minutes till everything is mixed together and form a big ball. Divide the dough into 2 equal halves. Use a parchment paper or plastic wrap and place one dough ball on it. Place another plastic wrap on the ball and roll the ball into a thin rectangular sheet as shown in the above picture. I gently pushed the cookie cutter (any shape) on to the plastic wrap and made design on the dough, so that I could cut it easily once the dough gets firm. Please see the image in the collage. Place this sheet of dough on a baking sheet and refrigerate for 30 minutes. Repeat the above steps of rolling the rest of the dough into thin sheet and refrigerating. 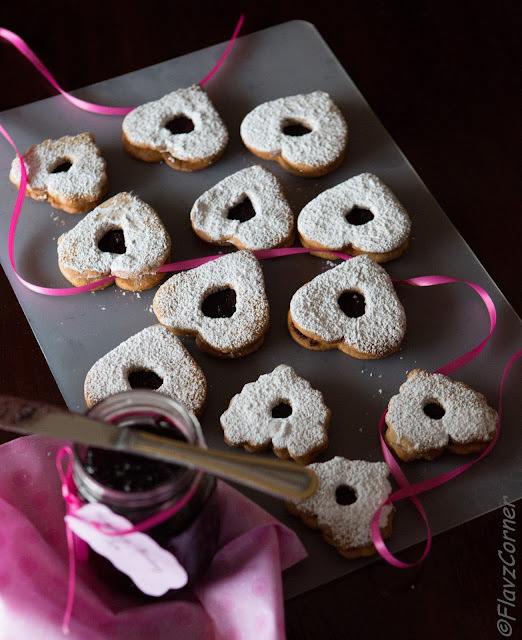 After 30 minutes, take the first set of rolled cookie sheet and cut the hearts (or any shape) using a cookie cutter. Place the cut cookies on a baking sheet lined with parchment paper and bake for 10 minutes and let it cool. With rest of the rolled cookie dough cut out enough hearts to pair with the first batch. Using a small heart cookie cutter, cut out small heart from the center of the big heart. I used the wide end of the cake decorating tip to cut circles out from the heart shaped cookies. Bake them for 10 minutes by placing them on parchment paper lined baking sheet. Once the cookies are cooled, place the cookies with hole on a board and dust the confectioners (powdered) sugar using a sieve. Apply a thin layer of jelly or jam on the cookies without the hole. Place the cookies with sugar dust on the cookie with jelly/jam to form a sandwich. Spoon little bit of jam/jelly into the center of cookie through the hole. Repeat the process for rest of the cookies. I ground roasted almonds with skin to make almond flour. You can buy almond flour if you don't want to make your own. Use 3 tsp of granulated sugar while pulsing the almond which will help to eliminate the tendency of almonds to form a paste. If the dough is sticky, put them in the refrigerator for 10 minutes before you start cutting the hearts. Feel free to cut the shapes as you desire. I used the remaining dough from the cut out hearts to make more hearts after refrigerating them. Repeat the process of rolling, refrigerating and cutting out hearts till no dough is left. I used a homemade blueberry jam to apply on the cookies. Feel free to use the jelly of your choice. Cookies look so cute, luv the shapes. Beautiful cookies Shibi...i love any cookie filled with jam...these look amazing !! What an appropriate cookie for Valentine's Day! Not only the shape, but the flavors are so well-suited to this holiday, IMO. Great job, great pictures. Thanks for this.